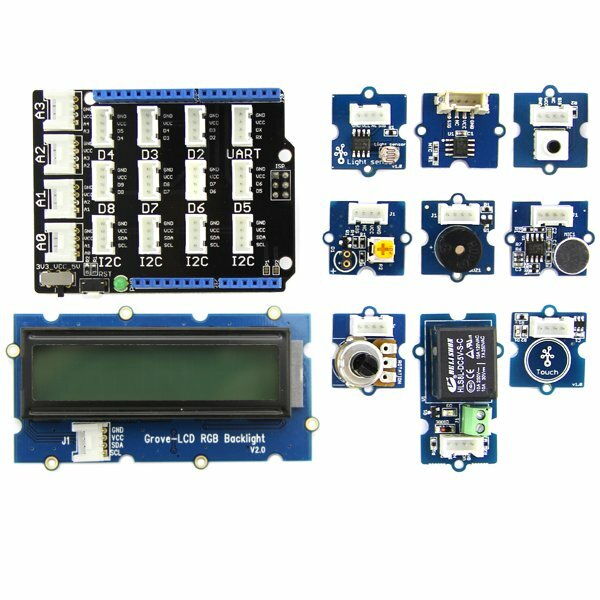 The Grove Starter Kit for Arduino comes with a Grove base interface shield, 1602 LCD, mini servo and a collection of basic modules. 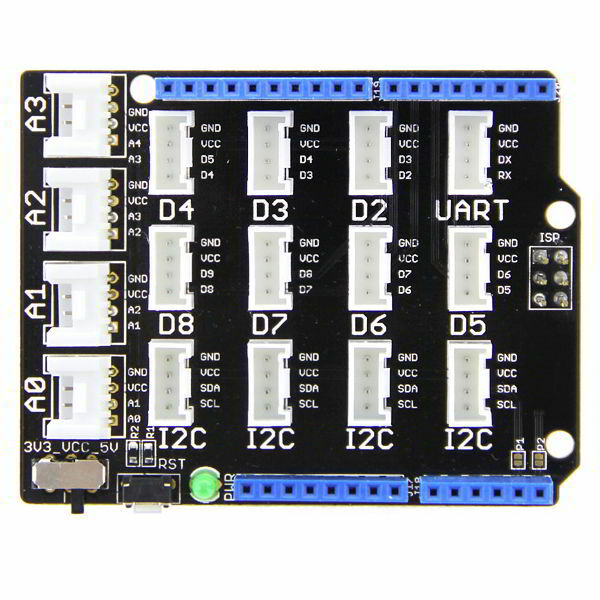 Grove compatible modules feature special 3 pin locking connectors with standardized pinouts for use with a variety of microcontroller GPIO pins. 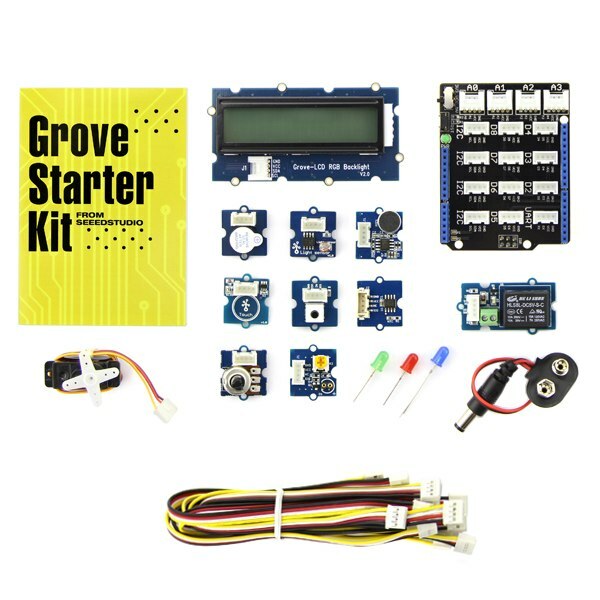 This starter kit comes with a Grove Base Shield that makes it easy to attach Grove modules to your Arduino compatible microcontroller. The shield provides plugs for analog, digital, i2c and UART based Grove modules. It can operate at 3.3V or 5V for use with a wide variety of Arduino compatible microcontrollers. All pins are passed through for extra convenience including the ISP connector. A power LED and easily accessible reset button are also provided. 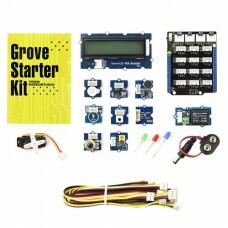 This set comes with 9 basic Grove modules, an LCD display and even a Grove compatible servo. Output modules include a Smart Relay, Buzzer and an LED. Input modules include a Button, Touch Sensor and a potentiometer based Rotation Sensor. Sensor modules include a Sound Sensor, Temperature Sensor and Light Sensor. The Grove compatible LCD module is controlled via i2c and features a 16 character by 2 row text display. It comes with English and Japanese character sets and the ability to add custom characters. A multicolored RGB backlight enhances the display. 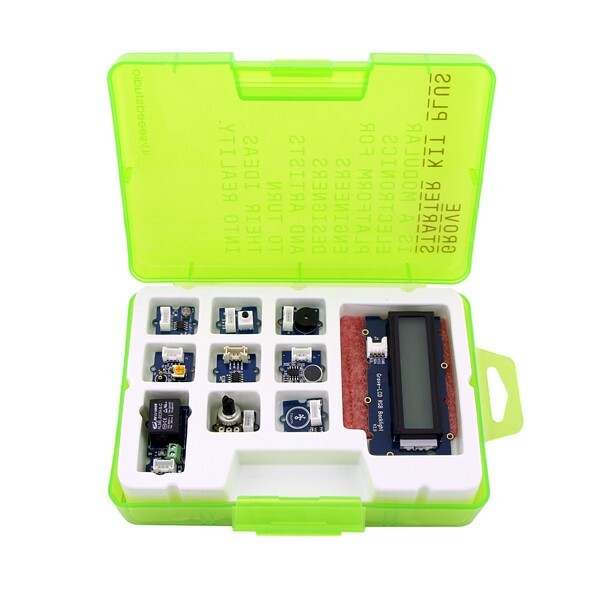 This set includes a Grove compatible mini analog servo, a 9V battery snap power connector, 10 Grove cables and three colored LEDs for use with the LED module. A handy case and Grover Starter Kit manual are also provided. You will need an Arduino compatible microcontroller with a suitable power supply to use this set. Arduino sample code is available to assist you.